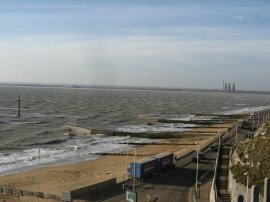 The Thanet Coast Path is a 20-mile route around the coast of the Isle of Thanet from Reculver via Margate, Broadstairs and Ramsgate to Pegwell Bay. I did this, the final part of the walk along the path on 3 February 2008. 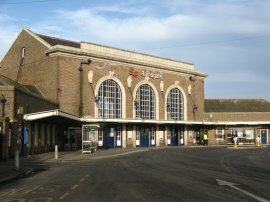 I drove down to Sandwich and took the train over to Ramsgate. 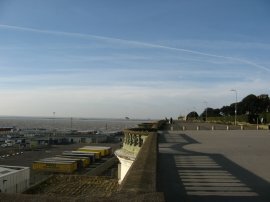 From Ramsgate Station, photo 1, it was just under a miles walk back down to the seafront promenade to rejoin the route of the Thanet Coast Path. As I was walking down to the promenade I headed past a couple of parakeets in the roadside trees, their range seems to be ever growing at the moment and I had also spotted some at Margate. Still none yet in Walthamstow though. Reaching the seafront the route heads along the West Cliff Promenade, photo 2, passing above Ramsgate Harbour. 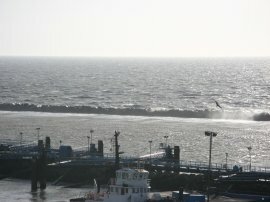 It was an incredibly windy day and as I was walking along the West Cliff Promenade I could see the wind was blowing spray from the waves far over the breakwater of the Harbour, photo 3. I couldn't recall being out on such a windy day for many years and unfortunately the wind ended up blowing directly into my face for most of the day. 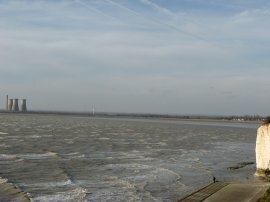 From the promenade there were extensive views over Pegwell Bay. Despite the extremely strong wind it was a much brighter day than when I had last been here and I was able to see much further down the coast towards Hastings, photo 4. A little further along the promenade the route passes the Hand and Molecules Sculpture, photo 5, this was commissioned by Pfizer and designed by David Barnes. 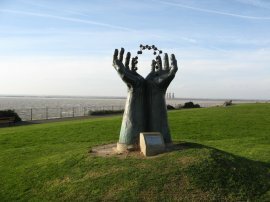 The sculpture was unveiled in 2000 to mark the opening of the National Cycle Network in Thanet. 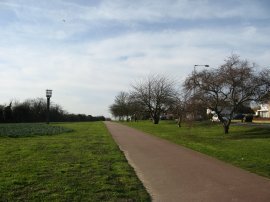 For much of its route the Thanet Coast Path has been following the Viking Coast cycle trail which is part of the cycling network. Reaching the end of the broad promenade the route turns to the right and heads up to join Pegwell Road where the route turns to the left, starting to head gently downhill. Following the road the route heads past the Pegwell Bay caravan park before turning left along a concrete track that runs just above the cliff tops which were now considerably lower than earlier on in Ramsgate. 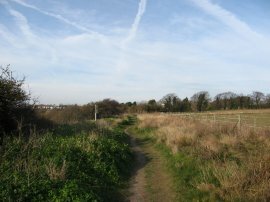 The track runs past some old coastguard cottages to join a grassy footpath, photo 7, that runs across the top of Pegwell Bay. 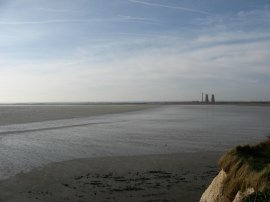 The tide was quite a long way out as I went past, exposing a large area of mudflats, photo 8, in the bay. Away on the other side of the bay I could see mouth of the River Stour, which by a circuitous route was going to be my ultimate destination for the day. 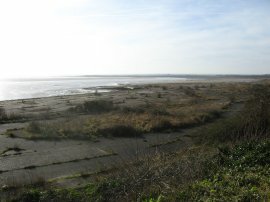 As the route makes its way around Pegwell Bay it passes the site of the old Hoverlloyd Hoverport, photo 9. Now there is hardly anything left to mark it location apart from the faint white markings on the tarmac where the cars used to queue. The site is now fast becoming overgrown and all the buildings that were once there have been demolished, apart from a concrete stair case leading down from the road above. 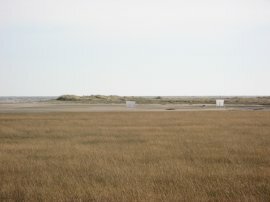 The route crosses over the slip road that ran down to the hoverport and heads up to a grassy area besides the A256 Sandwich Road. Here the route passes a replica of a viking longship, the Hugin, photo 10. 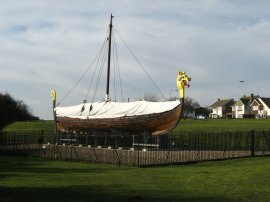 This had been sailed over to Viking Bay in 1949 to commerate the 1500th anniversary of the arrival of Hengist and Horsa who landed at nearby Ebbsfleet. 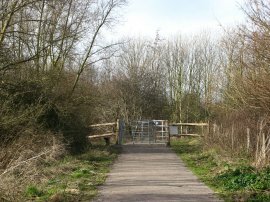 The route then joins a cycle track that runs alongside the Sandwich Road, photo 11. Just past a petrol station the route bears to the left along a footpath that runs close to the edge of the bay, photo 12, as the path enters Pegwell Bay nature reserve. 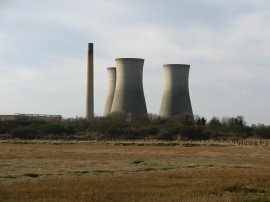 The Thanet Coast Path continues running close to the edge the bay as it makes its way through the nature reserve towards the mouth of the Great Stour River, photo 13, with the cooling towers of the old Richborough Power station, photo 14, growing ever larger ahead. 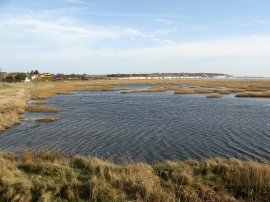 Eventually the path turns round to head inland and reaching a metal kissing gate leaves the Pegwell Bay Nature Reserve and reaches the end of the Thanet Coast Path, photo 15. From Pegwell Bay I walked the three or so miles down the A256 to Sandwich, where I had parked the car where I then walked the final stage of the Stour Valley Walk.